If you operate your trains without a caboose, then you’ll surely want to have a “Flashing Rear-End Device,” or FRED on the last car of the consist. Common among the prototype railroads, a FRED provides a bright red flashing indication that there’s a train ahead, and where the back of it is located. The FRED design presented here is a simple, low-power circuit that closely approximates the real thing. The circuitry can be easily housed in a convenient boxcar or something similar. Several types of power supplies are shown, including simple replacable (non-rechargable) batteries, battery-less direct track operation, and more-sophisticated battery power which recharges from the track whenever possibly. Your size limitations, inventiveness and “DIY appetite” may determine which you choose. You may want to build the just the flasher itself and see how it works using 2 or 3 good-ol’ everyday AA alkaline batteries; this will help to quickly build your enthusiasm, and get your creative juices flowing. The few parts required are readily available at Radio Shack and others; you might want to build your FRED on a small piece of “perf board” (also from RS); I urge you to socket the IC, don’t install the IC until you’re all done soldering, and keep things as compact as possible. You’ll probably want the LED to be remote from the flasher circuit, so think about connecting to the LED with two wires twisted together. Keep in mind that LEDs are semiconductor devices, and are not fond of heat; hence, always use some sort of heat sink when soldering to LEDs and their ilk. With the component values shown, the flasher should flash about every 1½ seconds. If you’d like yours to blink faster, you can either reduce the value of resistor Rt (now 10 megohms), reduce the value of capacitor Ct (actually two caps in parallel, totalling 0.147uf), or both. Reducing Rt to 5 megohms will double the flash rate; removing the 0.047uf cap will increase the flash rate by roughly 50%; doing both would make it blink way too fast. If you prefer a slower flash rate, you can increase Rt, increase Ct, or both; doubling Rt will reduce the flash rate by 50%, etc. etc. Feel free to fiddle if you want a different rate. In any event, I suggest leaving the 47K resistor alone. I also suggest including an on/off switch; there’s just no point in having the flasher flashing when you’re not operating the train! AND JUST HOW DO I POWER THIS THING? This circuit will operate on as little as 2 volts (but you’ll want a bit more). A pair of rechargable Nickel-Metal Hydride (NiMH) batteries will produce 2.4 volts with long life. At this voltage, the flasher may be a bit dim for your tastes…or not. If you want a brighter flash, try going up to 3.6 volts; you’ll get this with 3 NiMH cells or any one of many special purpose disposable and rechargable battery packs (eg, cordless phone batteries). With only 2 batteries, I’d omit the LED resistor (47 ohms), and connect the LED directly to Vcc; with three batteries (or a 3.6 volt pack), leave the resistor in. If you want rechargable batteries, I recommend the NiMH units over NiCads; the NiMH batteries don’t have the “memory effect” that plagues NiCads. If you opt for rechargables, you have two choices for doing the recharging: in the train, or out of the train. That is, you can “trickle-charge” the batteries from the rail power, hopefully never needing to remove them from their hiding place in the boxcar; or, you can remove them when they run down, and insert them into a tabletop charger. If you remove for recharging, the electronics are simple — nothing but the flasher circuit and the batteries; the trickle-charge route is more complex initially, but should require no intervention once it’s set up. The charger circuits below are very simple and use readily-available parts (and tolerate substitutions readily). If you wish, you can make Charger #1 output 3.6 volts by simply adding two more 1N4001 diodes in series with the six shown. If you substitute a 4.3 volt zener diode (not available from RS) for the 5.1V unit shown in Charger #2, you can omit the diode in series with the transistor’s emitter (output) lead. A slightly more sophisticated charger circuit can be created using the LM317 regulator IC; by connecting the IC as shown below, you create a constant-current charger, preferred by batteries the world over. 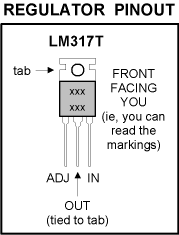 The LM317 comes in several flavors: the LM317T comes in a TO-220 power transistor package, and is available from RS; it’s a bit large, but if you have the space, use it. The LM317L (low-power version) is a good choice for smaller scales; it’s available from Jameco, Digi-Key, Mouser and others, and comes in a TO-92 small-signal transistor package. The circuit is the same for all of ’em, and the circuit is “self-adapting” to whatever battery configuration you use. If you can manage it, I urge you to use Charger #3…with whichever LM317 you can obtain. There may some power sourcing arrangements I haven’t included here; if you’ve thought of something that better fits your needs, Email me and we figure it out. USING DCC ? If you’ve discovered the joys of DCC, you can build your FREDs without the batteries (since the DCC signal is on the track at all times, it’ll keep FRED flashing); hence, you’ll want to apply the “Mods to Charger… for Track Power Operation Only (No Batteries). If you go for Charger #2, change that 39 ohm/1 watt resistor to a 100 ohm resistor; if you have 14 volts AC or less on the track, a 1 watt resistor is OK; if you have more than 14 volts on the track, you’ll want to make it a 2 watt resistor (or two 47 ohm/1 watt units in series). If you can swing it, go with Charger #4 (above) — you’ll get a well-regulated output and a nice, bright flasher. 1. Resistors are ¼ or ½ watt units unless otherwise specified. 2. 0.1 and 0.047 uf caps are 50V ceramic or film units. 3. Space permitting, AA size batteries may be used in place of AAAs; battery life will roughly double. 4. Substitutions for transistors or diodes may be freely made.